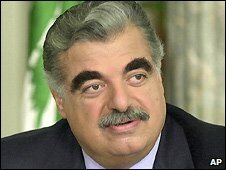 behind the assassination of former Prime Minister Rafik Hariri in 2005.
this body – to arrest the officers. The four officers were detained based on this fictional slogan. Major General Jamil Sayyed, former General Security chief. years in the General Security apparatus, until the fifth of June 2005. Major General Mustapha Hamdan, Presidential Guards chief. He was the only General –of the four officers- to remain in his post after the Hariri assassination. Major General Ali Haj, former Internal Security Forces General Director. He was appointed in 2004 as chief of the ISF. Brigadier General Raymond Azar, former Military Intelligence chief. He rarely appeared in public and had very little to do with the political and media milieus. years of their lives behind bars, not knowing why. The decision to free the generals comes less than two months before a finely-balanced legislative election that pits the pro-Syrian bloc against their pro-Western rivals, including Mr Hariri’s own political movement now led by his son. 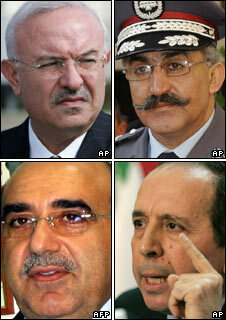 The four men in custody were pro-Syrian generals who all held senior positions in the country’s security infrastructure. “The pre-trial judge orders, unless they are held in another case, the release with immediate effect,” the judge said. “After 44 months, justice has been done. It should have been 43 months ago,” he told the AFP news agency. BBC analyst Sebastian Usher says the pro-Syrian opposition led by Hezbollah can use this decision to back up its belief that Syria had nothing to do with Mr Hariri’s killing. But it will be a blow to the pro-Western coalition that won the last elections and pointed to the generals’ arrest as clear vindication of their accusation that Syria was behind Mr Hariri’s assassination, he adds. Mr Hariri’s assassination prompted massive demonstrations, which led to an end of decades of Syrian control over Lebanon – although Syria denied involvement in the killing. Colombo Two top LTTE leaders, who gave themselves up before the Sri Lankan Army, have said the Tamil Tigers used the civilians as “hostages” never allowing them to flee the war zone and resorted to “mass killings” if they failed to heed. Velayutham Dayanithi alias Daya Master, former media coordinator of LTTE, and George, official interpreter of top leader, also appealed to the remaining Tamil Tigers to renounce violence and join the mainstream. “The LTTE is still using innocent civilians as hostages. They don’t let them go out of the areas controlled by them. ‘Viduthalai Puligal’ (LTTE cadres) have killed a number of people in Sudanthirapuram area when they tried to flee from them,” Daya Master, who surrendered to the Army last week, told the Sri Lankan state television. “More than 200 people lost their lives at the hands of LTTE in that one area,” he said. George said people were scared of LTTE and after the humanitarian operations started “little by little” they used the vantage points to cross over to the Government-controlled areas. “Many died when LTTE cadres, manning the vantage points, resorted to killing,” George, who was close to slain LTTE leader S P Thamilchelvan, said. Daya Master said he had been trying to escape LTTE for several years. “When the LTTE broke away from the peace talks in 2006, I decided to break away since I believed in negotiations,” Daya Master said. He said after killing innocent civilians who tried to flee, the LTTE put the blame on the Sri Lankan Army of killing them. Daya Master said the Tamil Tigers, now confined to a 5 sq km coastal land strip in Mullaitivu, were forcibly recruiting children in the age of 14-15 years. “People who were born after 1994, 95 and even 96 have been forced by the LTTE to fight. They were recruited forcibly… they (LTTE) did not even spare the families which had only one child,” Daya Master, who is now under the custody of the army, said. “They did not spare even people who were sick and were suffering from heart diseases… they recruited everyone and attacked people who refused to heed,” he said. Recounting his more than 9-day journey from the LTTE-held areas to the ‘Safe Zone’, George said being old he could not run away from the LTTE. “I could not run as I am old… I used the opportunity when people broke out in a group to escape from the LTTE. I was among thousands of people… so I was able to escape,” he said. Egypt’s president warned regional adversaries on Wednesday that he would not tolerate what he called their tampering his country’s security and stability, a reference to Iran and the Hezbollah guerrilla group that it supports. President Hosni Mubarak’s comments were his strongest words of warning since Egypt accused the powerful Lebanese militant group of plotting attacks in the country, and were also meant to send a strong message to the group’s backers in Iran. Egypt announced earlier this month that it had uncovered a plot by 49 men with links to Hezbollah to destabilize the country by carrying out attacks on Egyptian institutions and Israeli tourists. Hezbollah leader Hassan Nasrallah has rejected the accusations, while admitting that a Hezbollah member was in Egypt supervising weapons shipments to the militant Palestinian group Hamas that controls the neighboring Gaza Strip. Egypt and other Arab nations have watched with concern as Iran has deepened its regional influence through its support for Hezbollah and its development of nuclear technology, though Iran says it is not aiming to produce atomic weapons, as the U.S. and its allies suspect. “The Arab region is passing through a delicate and hard stage … and facing the threats of known regional powers that embrace terrorism and extremism and clearly brag of animosity to peace,” Mubarak said. “After these powers and their hirelings have encroached on Egypt’s security and sovereignty, I say clearly that I don’t allow this and will not tolerate those who try to tamper with Egypt’s security and stability,” he said in a speech. He did not mention Iran or Hezbollah by name, but it was clear he was referring to the two. Egypt’s allegations have raised concern about possible Hezbollah activity beyond Lebanon’s borders at a time when the guerrilla group and political movement, together with its allies, stands a good chance of dominating the country’s June 7 parliamentary elections. The United States and its allies among Arab governments like Egypt’s are also fearful that an electoral win by Hezbollah and its allies would increase the sway of the group’s backers Iran and Syria. I continue to believe that the election of President Barack Obama provides a major opening for progressives to make significant gains towards shaping a more just and humane society in the U.S. The repudiation of George Bush and company and their greed driven, “free market” economic policies have opened the door for progressives to advance a progressive agenda for far ranging change. However, it would be a mistake to believe that the change we seek will be advanced by President Obama. Though he is clearly on the liberal side of the political spectrum, which is a welcome shift from the eight-year reign of the rabid right, Obama never promised bold “change” during the campaign. And, early indications are that the change President Obama believes he can achieve is incremental, not fundamental. For example, at his recent summit on health care, proponents of single payer had to fight just to get in the room to have their voices heard – a clear indication that the President’s idea of “reform” is likely to be well within the framework of the existing health care for profit system. President Obama’s cautious, pragmatic, incremental approach is understandably infuriating to some progressives. The problem is that these progressives expect Obama to carry the weight for making far ranging change, rather than building a movement that will compel him to embrace and advance a more bold and visionary agenda. It is useful to remember that much of what was accomplished by progressives under FDR in the era of the New Deal was because of massive, unrelenting pressure from a multifaceted liberal-progressive movement. That lesson should not be lost on progressives at this potentially milestone moment in history. But, here progressives are confronted with another problem. To the degree that a progressive movement exists, it is incoherent and disjointed/fragmented. There is no overarching, inclusive umbrella organization with a broad consensus agenda to translate the desire for far ranging change into effective action. This does not mean that there are not groups, organizations, think tanks, publications, philanthropists, etc. that are advocating progressive policies and causes. I simply have no sense that there is anything resembling a functional united front among these various entities, particularly as it relates to the connection with and inclusion of African Americans and other people of color. I make the latter observation because I believe progressives need something akin to the National Rainbow Coalition as a unifying vehicle to advance the progressive cause. Bill Fletcher and Danny Grover made this point a couple of years ago in an article they circulated on recreating a Rainbow Coalition type formation. Without question, the demobilization of the National Rainbow Coalition by its architect Rev. Jesse L. Jackson was one of the great failures of leadership in the latter half of the 20th century. Borrowing from Mel King’s weekly rainbow dialogues and initiatives in Boston, Rev. Jackson was able to utilize his presidential campaigns to build a formidable, progressive, multi-racial policy, advocacy and electoral coalition that captured the imagination of millions of people across the country. Unlike many movements on the left, African Americans and other people of color, constituencies disproportionately affected by issues of race, class and gender inequality, were prominent in the membership and leadership of the Rainbow Coalition. The opening presented by the election of President Barack Obama cries out for such a formation again. To revive a term from another era, at a minimum, progressives should create a “third force” in American politics – an independent political organization that focuses on developing and advocating reformative and transformative policy proposals and actively educates, agitates, organizes and lobbies to enact its agenda. Such a formation should adopt an “inside/outside” approach, working to advance its agenda inside the major political parties while simultaneously promoting the agenda through liberal-left political parties and institutions/organizations outside of the major parties. In terms of electoral politics, a third force would support major and third party candidates based on its agenda as well as utilize the option to run independent candidates. Moreover, a third force would not depend on electoral politics as the sole means of advancing a progressive agenda; it would employ non-electoral strategies and tactics such as mass protests, supporting strikes and labor actions, mobilizing/organizing around issues at the local, state, national and international level as a means of broadening the base of the progressive movement to effectuate real change. The creative use of the Internet to disseminate information, galvanize action and raise funds must also be part of the strategy if a third force is to be successful. There are several other elements I could propose, but these ideas should suffice to make the case for the concept. Beyond the idea, the crucial task is creating a third force as a 21st century version of the Rainbow Coalition. This is a major challenge because the left tends to be too fractious and contentious to build this kind of umbrella formation. Though the left legitimately bemoans the flaws of charismatic leadership, in reality it was the force of ideas and charismatic leadership of Rev. Jesse Jackson that motivated progressives to defy their “nature” to become part of the big tent – the Rainbow Coalition. Surveying the scene today, there does not appear to be a leader who can unite the left. And, I am skeptical that there is presently a collective or collaborative of leaders with the vision, skill and capacity equal to such a daunting task. Nonetheless, some of us will continue to articulate the vision in the hope that the idea of a third force will gather momentum and come to fruition. Capturing the opportunity presented by the election of President Obama may well depend on it. The U.S. corporate media treat the world like a big comic book, with America as the super-hero who doesn’t know his own strength, but means well. Much of the time, the corporate media analysis doesn’t even reach the level of comic book – more like cartoons. In fact, just a few nights ago, I saw a cartoon on the Comedy Central channel that provided a much more sophisticated analysis of so-called “piracy” in Somalia, than anything offered by the television evening news. Thus, the cartoon succeeds in describing the life and death struggle of the Somalis and the arbitrary power of the Americans and others patrolling the Somali coast. The Americans here at home are totally ignorant of the true situation in Somalia, while the Americans manning warships and war planes have no problem with killing people they don’t know – people who are made to look like cartoon cut-outs. It is impossible to discuss lawlessness in Somali coastal waters without confronting the U.S. and European role in destroying the rule of law in the country. The chief culprit is the United States, which encouraged Ethiopia to invade Somalia, in 2006, in order to depose the first government the country had had since 1991. Since the early Sixties, U.S. policy in Africa has been to sow chaos in those regions it cannot effectively control. The Somalis drove the Ethiopians out, much to the chagrin of Washington. With the increase in ship hijackings, the Americans and Europeans spin the situation as one in which they must impose order on Somalia – when, in fact, it is outsiders’ attempts to dominate Somalia that have led to such grave disorder. We now learn that France and Spain, among the maritime powers most guilty of illegally poaching Somalia’s fisheries, have designated themselves as the guardians of the Somali coast. The French and Spanish have enjoyed a bounty of fishing off Somalia, with no Somali coast guard to keep them from taking as much as they want of the national resource. So, the biggest thieves of Somali fish choose themselves as protectors of the fisheries. France and Spain both base their fishing fleets in the nearby Seychelles Islands. Any dispassionate observer would conclude that the French, the Spanish and the rest of the freeloaders are reverting to a kind of piracy of their own, like in the good old days when whites sailed the world and took what they wanted. But then, that’s a cartoonish way of looking at the world – or is it? 29/04/2009 Lebanese Speaker Nabih Berri said on Wednesday that the massive Israeli maneuvers scheduled between May 31 and June 4, were extremely dangerous, aimed against Lebanon, Syria and Iran and would take place along the Lebanese-Palestinian border. Berri praised Lebanese security forces for dismantling Mossad linked networks recently. He stressed the maneuvers come at a time when Israeli spy agents have been increasingly active in Lebanon in a clear violation of UN resolution 1701. The Speaker underlined the necessity that Lebanon undertakes defensive measures on every civic, political and diplomatic level with the coordination between the Lebanese Army and the Resistance being a top priority. On Tuesday, Loyalty to the Resistance bloc leader MP Mohammed Raad said that Lebanon must go on high alert in anticipation of Israel’s largest-ever maneuvers. “Lebanon is one of Israel’s targets during the exercises. The country must be fully prepared for such an emergency,” Raad told the national dialogue session on Tuesday. The Hezbollah MP distributed extensive literature on the operation dubbed “Turning Point 3” with details on targets, scenarios and steps to counter a possible threat. On the civilian level, to put civilian establishments- such as hospitals and civil services institutions- on alert for any surprising attack. On the military level, to coordinate defense efforts between the Lebanese army and the Islamic resistance in face of any Israeli threat. On the political level, to launch a political and media campaign in the world to expose the Israeli enemy as a side always willing to launch wars. Earlier this month, the Jerusalem Post said Israel and the United States will hold massive joint missile defense drills later this year, testing three anti-ballistic missile systems. It did not give a date for the maneuvers. The exercise, named in Israel as Juniper Cobra, will see the testing of the Arrow (Hetz) system as well as the THAAD (Terminal High Altitude Area Defense) and the ship-based Aegus Ballistic Missile Defense System. Israeli and U.S. forces have staged the Juniper Cobra exercise over the past five years but the Post said this year’s drill was likely to be the most complex yet and will for the first time include the launch of interceptors. The drills are expected to last an entire week and prepare the nation for a series of scenarios that include missile strikes with conventional and non-conventional warheads, fired by Hezbollah, Syria or Hamas, Israeli military officials said. The reaction time to prepare for impact of a rocket attack in Israel is roughly two minutes or less. The Home Front Command and Israeli occupation forces said they want drills to encourage people to prepare for the possibility of war. The aim, according to defense officials, is to put the Israelis on alert as if the war is going to start “tomorrow morning”. The Israeli military will implement the lessons drawn from their defeat in the 2006 war on Lebanon on top of which would be the military and political leaderships’ performance that has proved a failure.